Each year UMA awards over a million dollars in scholarships! Scholarships are financial awards, which do not have to be repaid. Full time and part time UMA students have an opportunity to apply for a number of scholarships as a result of funding made available by the University of Maine at Augusta, the University of Maine System, and generous donations by organizations and individuals to UMA’s scholarship fund. Many UMA scholarships require one to submit the following UMA General Scholarship Application. You’ll need to be signed into your UMaine GMail account to access the form. The General Scholarship application will open on Friday, February 1, 2019 with a deadline of March 1, 2019. To be considered for general scholarships, a completed scholarship application must be received by UMA Student Financial Services by this deadline. Please use the tabs below to explore UMA scholarships, specific qualifying criteria, application steps and submission deadlines. Scholarships for new UMA students who are first time college students. Covers the remainder costs of tuition and mandatory fees after the application of Federal, State and additional grant resources. New in-state full-time and part-time transfer students who have earned at least 30 transferable credits, and are new to the University of Maine System. Students currently attending another UMS institution are not eligible in Spring 2018. New in-state, first-time full-time students in Fall 2018. Must meet in-state residency requirements and be U.S. citizen or eligible non-citizen to receive Federal financial aid. Must be eligible to receive Federal Pell grants as part of the financial aid package for the academic year. Must have met all entrance requirements and be regularly admitted to a bachelor’s degree program. Must maintain published minimum credit hour enrollment to remain qualified. Complete details on the Pine Tree State Pledge are available here. FAFSA must be submitted annually to determine continued eligibility in the Pine Tree State Pledge program. Named after former President Richard J. Randall, and Mary Elisabeth, Vice President Emerita of Enrollment Management. Earn a UMA cumulative GPA of 3.0 each semester. *FAFSA prior to March 1 for each academic year in order to be considered. **Completed UMA General Scholarship application packets must be received by UMA Student Financial Services by March 1, 2019. UMA General Scholarship Applications are also available in Student Financial Services on the Augusta campus and at various Sites and Centers from January through the first week of March. Scholarships for current UMA students. The Maine Roads Scholarship Program awards money to help pay the costs of earning a Child Development Associate (CDA) credential or a college degree at any level from Associate to Master’s. For adult and non-traditional students. Next Step Maine Scholarships are given to employees who are engaged in taking additional steps in their education and skill development and who are considered promising contributors to the organizations for which they work. The AAUW Scholarship Program is intended for non-traditional female students who have been out of high school for at least one year and who wish to enroll or have already enrolled in the college. The Mid Coast Hospital Auxiliary raises money to encourage local area students who are interested in the healthcare field. The Competitive Skills Scholarship helps workers learn new skills and Maine businesses access a qualified workforce to succeed in the changing economy. The program is open to eligible Maine residents with access to post-secondary education – including certificate programs and two- and four-year degrees – training for industry-recognized credentials, and support leading to skilled, well-compensated jobs with anticipated high employment demand. Scholarship assistance will be given to one UMA Brunswick Center senior student in either a UMA B.A. or B.S. degree program who has completed at least two semesters at the Center and is in good academic standing with a minimum GPA of 2.5. Preference shall be given to students who demonstrate volunteerism. The Business and Professional Women in Maine (BPW/ME) Futurama Foundation offers the Continuing Education and Career Advancement scholarships. Maine state recipients are awarded a $1,200 scholarship. The local BPW organization selects a candidate for these scholarships from the applications received. These candidates are forwarded to the Foundation for final selection at the State level. This local organization offers a $500 scholarship to a college student who is continuing her post-secondary education by taking at least 3 classes per semester. The scholarship money will be awarded the second semester of the recipient’s year at a college or university. Children and surviving spouses of an active duty member of the Armed Forces who died in the line of duty on or after September 11, 2001 are eligible for this benefit. This scholarship is designed for adults entering Eastern Maine Community College (EMCC) and who have either graduated from high school prior to 2007, or left high school prior to 2007 and completed an adult diploma or GED. For any Ellsworth High School graduate attending EMCC. The Lewiston Area Adult Promise (LeAP) Collaborative is committed to helping adults achieve their post-secondary aspirations. This scholarship is available to students matriculated at CMCC, MCHP, UMA, or USM. To be eligible, students must either live, work, or go to college in Androscoggin County. Up to $3,000 may be awarded to cover the full cost of attendance which includes: tuition, fees, books, uniforms, housing assistance, transportation, child care and other living expenses while attending college. With local partners, the UMA Rockland Center raises scholarship funds to help you pay for college. Due to the generosity of United Mid-Coast Charities, the UMA Rockland Center has the ability to award some scholarships up to $750 to first-time college students with financial need. In particular, we hope to encourage students who do not have access to other financial support systems. Funds must be applied directly toward tuition, book costs and University fees. Applicants must take placement tests, be a resident of Maine and have earned a GED or high school diploma. Due to the generosity of United Mid-Coast Charities, the UMA Rockland Center has the ability to award some scholarships up to $750 to students returning to college to finish a degree after at least a 5 year absence. In particular, we hope to encourage students who do not have access to other financial support systems. Funds must be applied directly toward tuition, book costs and University fees. Applicants may need to take placement tests and must be a resident of Maine. If you are in good standing in an accredited nursing program, this scholarship is administered by Rockland District Nursing Association (RDNA), a community nursing service long supported by the Brown family. One scholarship award of $500 will be offered each year. As funds permit additional awards may be granted. Scholarship awards are based on financial need and college course grade point average (GPA). Applicants may reapply each year, as long as they are enrolled in an accredited nursing degree program. The West Bay Rotary Charitable Foundation invites applications from non-profits, organizations, programs and cities or towns for donations up to $2,500. This funding shall be applied to general operations, specific projects/programs or capital needs. This is a donation request form. Intended for recent Knox County high school graduates who wish to begin college at the UMA Rockland Center but who may have missed out as seniors on some high school scholarship opportunities. Inquiries and applications may be made through academic advisors Deborah Meehan or Chip Curry. Complete the attached form and submit the form along with required essay and transcript copy. The scholarship committee will review all applications.The scholarship will be awarded based on the information gathered through the application and other required material. All applications should be submitted to York County Senior College, “Attn. Scholarship Committee”, 4 Scamman Street, suite 18, Saco, ME 04072. Deadline for submissions is March 30 each year. The Scholarship award will be presented at the Student Recognition ceremony in later April at UMA Saco Center and at the Annual Senior College Luncheon held in June. For applications or for more information, please stop by UMA Saco Center. Explore University of Maine System scholarships, qualifying criteria, application steps and submission deadlines. 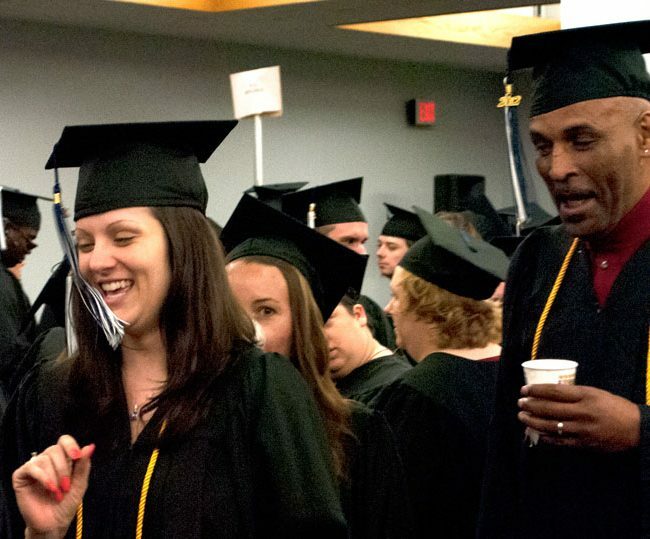 Are you a Maine adult who wants to return to college? You may qualify for as much as $4,000 per year in scholarships for up to four years. The University of Maine System’s Adult Degree Completion Scholarship aims to help Maine people complete their academic studies. This scholarship is for adult students returning to college after an absence of three years or more, and who are completing their very first baccalaureate degree. August 1 – to be considered for a full academic year award beginning in the fall semester. December 1 – to be considered for a spring semester award. All renewal applications are due no later than June 1 of each year. The electronic application takes approximately 15 minutes to complete. Prior to completing this application, we recommend contacting your campus Navigator. If needed, campus Navigators can also provide a paper copy of the application. A resident of the state of Maine. A student accepted at a University of Maine System campus seeking a first baccalaureate degree. An undergraduate reentry student who has experienced a gap (three years or more) in the pursuit of postsecondary education. Previously earned a minimum of 30 credits from any institution. Demonstrate financial need as determined by a completed FAFSA. Registered at least part time: 6‐8 credits per semester. Click to Renew your ADC Scholarship - Now Available! The University of Maine System offers Osher New Beginnings Scholarships to encourage Maine people of all ages to try college. Accepting new scholarship requests for the Spring 201 semester! Osher New Beginnings Scholarship can cover one course, including books and required materials. will commit to completing a college course. Courses are available at all Campuses, Centers, and Online. Interested students must complete the Osher New Beginnings Scholarship request form (pdf). A Maine-Ireland student exchange which honors the Northern Ireland peace accord brokered by Senator Mitchell between the governments and peoples of Ireland and the United Kingdom. This is available to currently practicing, certified Maine K-12 teachers in the areas of mathematics, science or foreign language. The University of Maine System Board of Trustees and State Legislature have established a number of different tuition and fee waiver programs for the benefit of students attending a university. If a student meets certain criteria, that student may qualify for reduced university tuition and, in some cases, fees. Web: Find the latest student-specific information on MaineStreet. In person: Student Financial Services is located on the second floor of the Randall Student Center. Office hours are: Monday through Friday, 8 a.m. to 5 p.m. EST. In Person: Stop by the Admissions Office in Lewiston Hall, 65 Texas Avenue. Bangor office hours are 8:00 a.m. – 5:00 p.m. Monday – Friday. Contact your Student Service Coordinator. Never pay for a scholarship search!